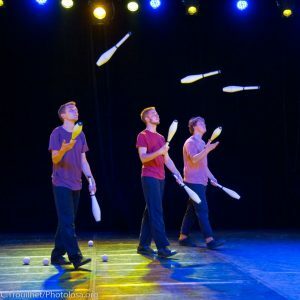 A usual feature of the Auch International Circus Festival, Circle is an opportunity for students of circus schools in FEDEC to perform a specially put together work. This year, for the 10th anniversary of Circle, schools were paired up and students were given a chance to meet and compose a piece of their own devising. 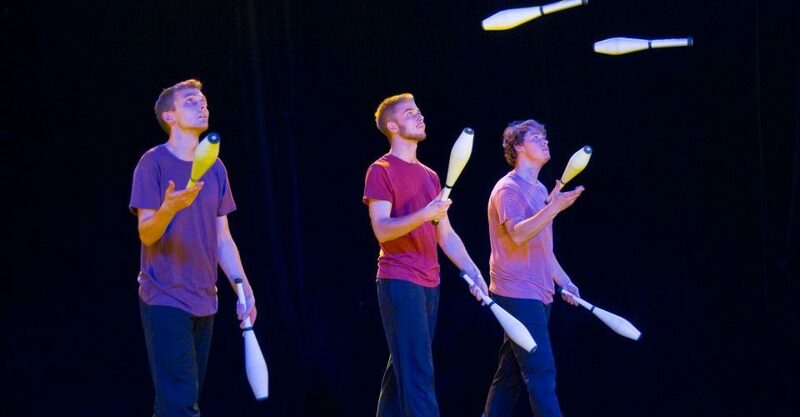 I was chosen to represent the National Centre for Circus Arts and was paired with three graduates from Circomedia; Robin Dale, Charles Brockbank and Jack Bailey. I traveled to Circomedia and worked for a week in their school developing the main skeleton of our piece. The next week was spent in the Creation Studio of NCCA finalising the piece with Jack Horner acting as an outside eye for the process sadly due to illness Jack Bailey could not take part in the final show, so we had to also overcome the challenge of turning a four-person show into a show with a cast of three. The final result was a fun juggling show which goes on a journey though conformity and unity to release, fun and individuality before coming full circle back to unity. It was great to perform at the festival and a valuable insight into circus outside the UK. Pictures of the show can be found in the below link of the FEDEC website. Thanks to the NCCA for choosing me to represent the school and my team for a very enjoyable creation process!